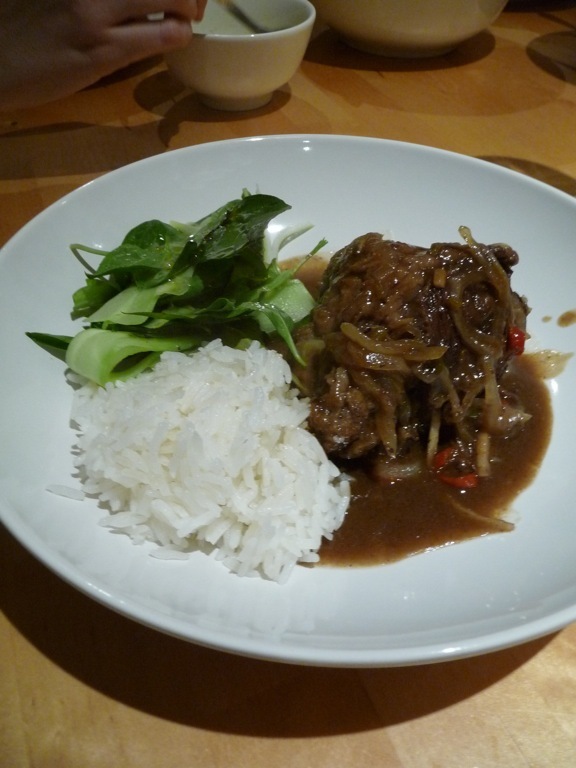 These Thai Braised Beef Cheeks are one of my signature dinner party dishes. They are ridiculously easy to make and the end result is luxuriously rich, melt in your mouth meat. Simply brown the beef cheeks, then place all of the ingredients in your slow cooker. Flick the switch, walk down to Casa Del Lygon (AKA the ‘House of Trouser’) to watch the AFL Grand Final (only to have it result in a draw!) and drink far too many beers, followed by far too many G&Ts. 8 hours later when you finally walk back in the door, dinner is ready. Don’t be put off sourcing beef cheeks either – they are the new lamb shanks, except they are très thrifty (which is French for cheap). Only $4.50 a kilo from the markets or your local butcher. I get mine from the Meat Hall at the Queen Victoria Markets. Ask your butcher to trim the jowl (lower part of the beef cheeks), as this makes preparing this dish even easier. The recipe below has been modified from a Valli Little recipe from the book ‘Faking It’. It serves at least 6 people. Heat the oil in a heavy based pan over medium-high heat. In batches (of about 3 to 4 pieces of meat depending on the size of your pan), brown the beef for 2 or 3 minutes on each side until crispy and golden brown. Make sure that your beef is well browned to ensure that it does not look grey and unappetising after slow cooking. Serve with Coconut Rice and Asian Herb and Cucumber Salad on the side, plus lots of red wine. I had this dish (or something very like it) at the London Tavern the other night. So yummy and I’m so happy to find a recipe online. I’ll be trying it out myself as soon as I can get to the market. I made your recipe a couple of days ago. I pretty much followed it exactly though I did add a couple of star anise, and galangal powder instead of fresh, but OH MY GOD it is fantastic! Thank you so much for sharing. I’ll be serving it to a few Vietnamese clients and I’m quietly confident they will be very happy. I did this tonght for the first time and cant say its pretty amazing. I also did coconut rice and a green curry foam to go with it. Probably the best thing ive cooked for a while. Delicious…and the cheeks fell apart. There wasn’t enough room in the casserole dish for the extra 3 cups of water so I’m really glad I didn’t put in all the fish sauce suggested! Even half the amount still resulted in a very salty dish. I’ll be reducing the salty ingredients all-round next time, rather than add too much more water, as it didn’t really need any more sauce to cook in.